Eat your way around the Golden Ring: 5 authentic Russian culinary adventures. Ancient little churches and old cozy kremlins are not the only things worth experiencing in the cities of Russia’s Golden Ring – local culture is also well preserved in its culinary traditions. The Golden Ring (Zolotoe Koltso) is the oldest tourist route in Russia. In 2015 this popular route for travelers from all over the globe as well as throughout the world’s largest country turned 50 years old. Eight cities from the official route dance a circle around Moscow: Pereslavl-Zalessky, Rostov Veliky, Yaroslavl, Kostroma, Ivanovo, Sergiev Posad, Suzdal and Vladimir. Arguably five smaller cities belong to this list as well: Aleksandrov, Yuriev-Polsky, Tutaev, Uglich and Plyos. More than one million tourists annually go around the Golden Ring trying to grasp the mysterious Russian soul and see the genuine Russia. This authenticity is preserved not only in the architecture of thousand-year old cities and folk art and craft centers, but also in the dishes of local cuisine and old recipes. The Rostov onion (the city of Rostov Veliky is situated 133 miles north-east of Moscow) used to be the equivalent of gold in the heyday of local merchants and has been part of the basic diet of the city's residents for several hundred years. 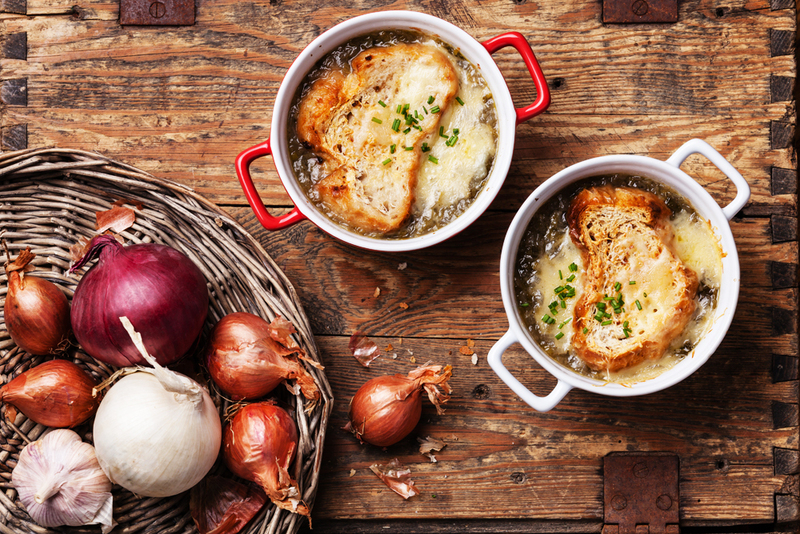 The French would appreciate the culinary inventiveness of the locals: they eat onion broth, cream of onion soup, baked stuffed onions, onion jam and sunny gold onion buns, where onion is used as a base for the dough, not as a stuffing. Pike from Rostov’s Lake Nero is believed to be a magic fish that makes dreams come true in Russian fairy tales. It is cooked here as a local delicacy. A non-standard combination of pike cutlet with an onion marmalade of a delicate consistency makes one examine Russian cuisine with new eyes. The taste of this marmalade emphasizes the flavor of meat in such an interesting way that it would make a perfect sauce for homemade burgers. By the way, onion jam and marmalade make a perfect edible souvenir to take home and costs only 400 rubles ($6). Where to try: Fish restaurant Shchuchy Dvor (Pike Yard) and the café-theater Lukova Sloboda. Payment is accepted in cash only. Guided tours in English and tables should be booked in advance by e-mail. A gastronomic symbol of the city (88 miles north-east of Moscow) is vendace, which in the tsarist era was always on the menu during inauguration feasts. The only place where a special Pereslavl kind of vendace can be caught is at Lake Pleshcheyevo. This is where Peter the Great conducted test trials of the first prototype ships built for the Russian fleet soon after he had established it. During the fishing season from May to September smoked and salted vendace can be bought from local women at Nikitsky Monastery, while fried vendace can be sampled at a cafeteria. Local fish connoisseurs recommend eating this specialty as follows: put a fish on its belly and slightly tap a knife on its spine and you will be surprised to see how easily the meat falls off the bones. Where to try: tourist center Fisch Herberg. Payment is accepted in cash only. Due to the Yaroslavl farmers' inventiveness (Yaroslavl lies 169 miles north-east of Moscow) that they have resorted to during the food import ban introduced by the Russian government and the policy of import substitution, a new attraction for foodie-travelers has emerged here. Not only tasting, but also watching the process of production of Russian, Holland, French and Swiss-style artisan cheeses has now became possible at Maria Koval's private artisan dairy, a private cheese creamery in Yaroslavl Region. From chevre, a soft goat creamy cheese with white mold, to hard cheeses that age up to one year such as chevron, chevrotella and campomorone – all these cheeses are produced by hand from local milk. It is possible to taste and buy edible souvenirs on the premises. Payment can be made in cash only. English language tours can be booked in advance by e-mail. Perhaps the only library in the world where eating is not only not prohibited, but is actually welcome is located in the village of Semibratovo (143 miles north-east of Moscow) in Yaroslavl Region. The “jam library” is how local enthusiasts call this interactive museum that honors one of Russia’s most popular desserts to accompany tea. The library’s delicious and informative “volumes” will tell you about the desserts preferred by Ivan the Terrible, about how Russian maids cast love spells on young men with the help of jam and about what Pushkin’s favorite jam “bersenevskoye” is made of. You will learn all this and more during the tasting session, a traditional Russian tea-drinking party held around a samovar in the library. English language guided tours must be booked in advance by e-mail. The most unusual jam that for tasting and purchasing is fir tree cone jam that can be used as a delicious medicine that can help you fight colds. The cones are soft and spicy, they are good to chew on and the pine aftertaste makes this jam a good companion not only for tea, but also for Rostov onion buns.